Begin Session Failed. S0000 00000 [QODBC] QB Begin Session Failed. Error = 80040408, Could not start QuickBooks. Begin Session Failed. S0000 00000 [QODBC] QB Begin Session Failed. Error = 80040408, Could not start Reckon Accounts. Your QuickBooks file should be accessible and should not be in the restricted folder. Please start QuickBooks application, log in to your QuickBooks company file as QuickBooks Admin user. Try connecting to QuickBooks Data using your application. If you are still facing the issue, Please make sure that your QuickBooks is not running as "Run as Administrator". 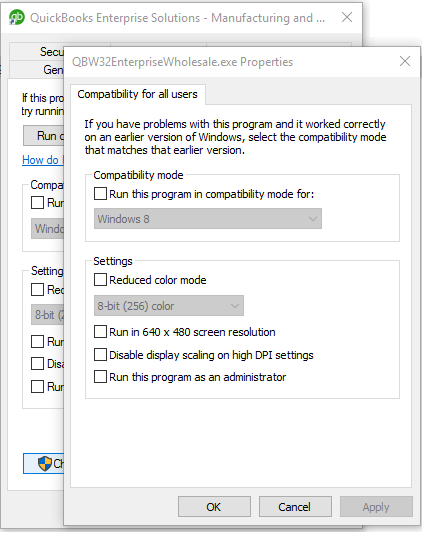 You can verify it by right-clicking QuickBooks shortcut, go to "Properties" & navigate to "Compatibility" tab & make sure that "Run this program as an administrator" option is unchecked. If this option is enabled, then please disable it & apply the changes. 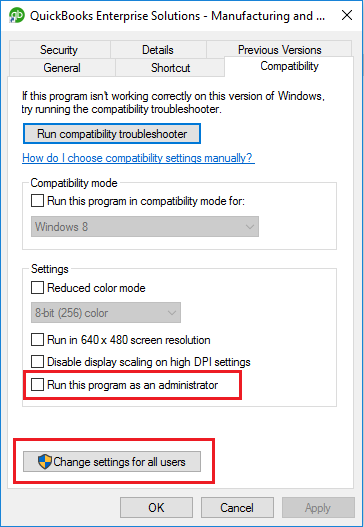 Click "Change settings for all users", verify that "Run as Administrator" is not selected. Make sure "Run as Administrator" or "Run this program as an Administrator" is unchecked. Click Change settings for all users. Please navigate to the QuickBooks folder under program files. Please restart Close QuickBooks application and restart your machine. After restart please start QuickBooks and login to your QuickBooks company file as QuickBooks Admin user. Optional - You may switch to single user mode. Try connecting with your application. If you are still facing the issue, please try connecting to QuickBooks using QODBC Support Wizard. 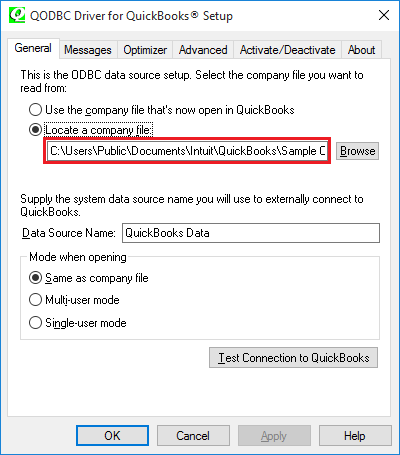 If you are trying to run QODBC/QuickBooks in auto login? And is your machine having Terminal serviced/remote desktop enabled? i.e. multiple user logging into your machine using the Remote desktop connection. 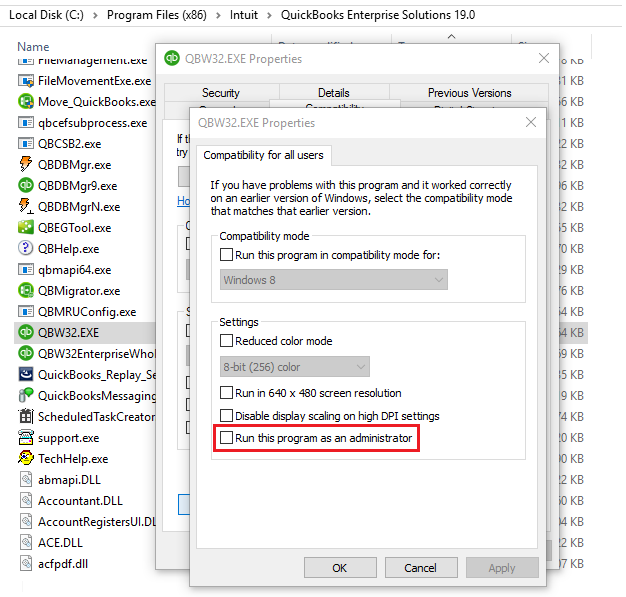 Then, I would like to inform you that QuickBooks SDK has a known issue with this type of Environment setup and cannot start the QuickBooks in the background. (If more than one user is logged into machine and QBW32.exe is running on more than one user account). Workaround for the above issue. 1) Make sure you unselect the option of "Keep QuickBooks running for quick start-up" under QuickBooks -- Edit Preferences -- General. Also, Please verify the company file path on QODBC and QuickBooks, these two paths should be the same. You can find QODBC company file path via QODBC setup screen -> General tab. You could find the QuickBooks company file via QuickBooks UI, press F2 key you will see the file information. 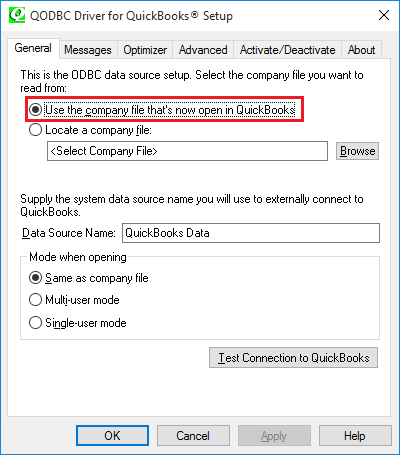 You can select "Use the Company file that's open in QuickBooks" and test again. If QuickBooks is already open and you are getting this error then please make sure you are not running Your Application in elevated user context, i.e. you should not run it as "Run as administrator". 20140321.113817 I 3404 CertVerifier The Authenticode signature validated OK.
20140321.113817 I 3404 RequestProcessor Previous instance of QB is going down..! Wait and retry to get a new instance. 20140321.113818 I 3404 RequestProcessor Previous instance of QB is going down..! Wait and retry to get a new instance. 20140321.113819 I 3404 RequestProcessor Previous instance of QB is going down..! Wait and retry to get a new instance. This is showing that your app is running under an elevated permission. 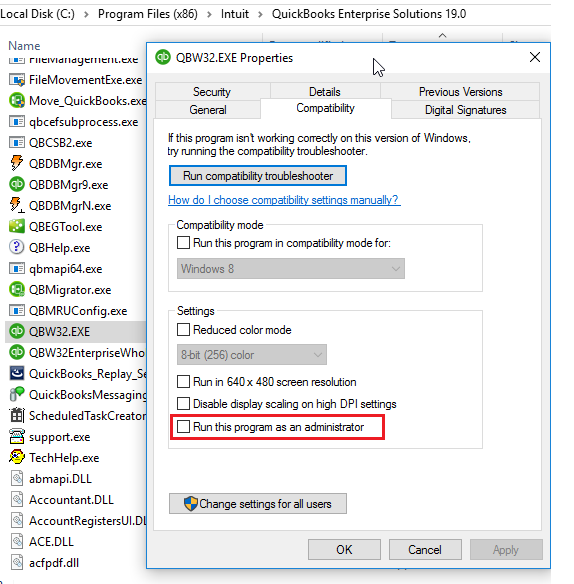 QB and the app have to be running at the same level, either both as the standard user or both using Run As Admin. They cannot be mixed. Try fixing the permissions and see if that resolves the issue. This also happens when there is more than one user logged in (and has QBW32.exe running in user process) to the machine using ( remote desktop connection ) and trying to run QuickBooks with auto Login. QuickBooks SDK shall not able to find the instance in such case. A workaround is to keep QuickBooks running, No need to login to the machine, just keep the window open. Will there soon be a fix for multi-user environments? We are able to get around the problem with the suggested workarounds, but it presents more failure points that we would like to remove eventually. 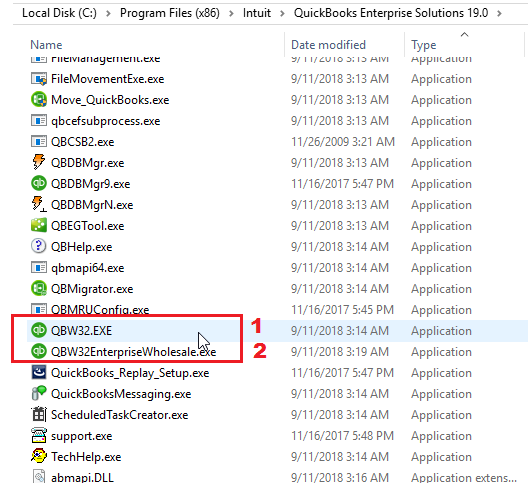 I would like to inform you that this is known issue with QuickBooks SDK (In Multiuser Environment setup and cannot start the QuickBooks in background.) not with QODBC. I would like to inform you that recently QuickBooks has fixed this issue on QuickBooks 2014 R6. Fixed an issue that caused QuickBooks to close when duplicating a transaction after a menu item is added through the SDK. Fixed an issue that caused the error “Could not find or create an instance of QuickBooks using InstanceFinder”, when connecting to QuickBooks while it is not running in UI. So you may try QuickBooks 2014 R6 or above version. We are still running into this problem on QB Manufacturing and Wholesale 2015 R6P. Is it possible that this has not been addressed in this version and build? To know whether issue resolved in QuickBooks or not. You should refer release note of QuickBooks. Please provide a link or navigation directions to the release notes that you are referring to. You need to get in touch with Intuit for QuickBooks release note.